Seafood mushroom is also known as Hypsizygus marmoreus. In Japan, it is called Crab mushroom for its tender, crisp texture and delicious flavor. 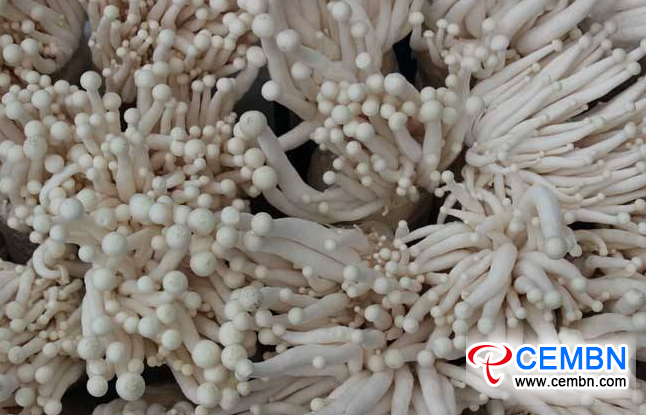 Seafood mushroom is high in edible and medicinal value, it is packed with abundant amino acid and polysaccharide, regularly adding Seafood mushrooms to your diet can help ward off cancer, boost immune system, fight against the aging and extend your life. Preparation of Compost: The permeability of compost is very important and it determines the growth speed and robustness of mycelia. Here are some formulas for your reference. NOTES: Raw materials should be fresh and free from mould, corncob should be smashed into granules which are 3-4mm in diameter. Growers could take materials in accordance with local situation, choose the formula, accurately do the weighting, add water and mix well, and adjust it with lime water. Bagging and Sterilization: Choose low-pressure polyethylene angle bag with a fold diameter of 17cm and 30-33cm in length. Growers could put 500g of dried materials in each bag and control the height of the bag at 18cm. Besides, be sure to master proper degree of tightness when bagging. After the bagging, do the sterilization under atmospheric pressure (100 degrees Celsius for 14-16 hours). Cooling and Inoculation: For sterilized nutrient bags, when the temperature gets down to 60 degrees Celsius, timely remove into cooling room, when it drops to 30 degrees Celsius, implement the inoculation. When it comes to the inoculation, all the procedures should be in accordance with aseptic technique. A 500ml of tank bottle can inoculate 25-30 bags of culture while a 250ml of water bottle inoculates 10-15 bags.